Here I am in this crowded, funky, polluted, South American city, by reputation the most murderous spot in the world, and I'm having a "chill" time. Is this really Medellin, Colombia, drug-cartel epicenter, of which our State Department issued dire warnings and tourists fear to tread? "The mentality has completely changed," I'm told by locals. "Killings are way down. In fact, everyone wants peace." And everyone I meet is charming and hospitable to this traveling Bostonian, urging me to spread the word to potential visitors. I was in Medellin as a guest speaker for a cultural journalism conference, the sole American, lecturing about film criticism in the USA. "I come from an anti-intellectual country," I offered them my pessimisic ramblings, "where critics are perceived as negative snobs who claim some special knowledge and speak in an elitist way. Even college students prefer the runaway democracy of the Web, where 'everyone's a critic,' with its thousands of amateur sites. Americans get what most seem to want: an optimist, philistine President who barely speaks English." The audience chuckled at my anti-Bush jab, though Colombia is a rare Latin counry today where the government aligns with Washington. President Alvaro Uribe has visited George W., his ideological amigo, at the Crawford ranch. In 2004, Bush flew into Colombia, and there equated his own triumph stopping terrorism with Uribe's success, with American help, curbing the drug trade. In fact, the most fearsome thing I saw in Medellin were the steely-eyed US officers staying at my hotel--beer guts and buzz cuts--who hopped in a Colombian army truck one morning for some kind of nefarious joint operation. So what's a tourist to do in Medellin? There's a cathedral said to be the largest brick structure in the world, and a smashing new metro system. More significantly, Medellin is the home town of world-class artist Fernando Botero. His fatso statues squat all over a city square; and the National Museum of Colombia includes 23 oils and 27 drawings, including brilliant early work, donated by their native son. But the most extraordinary thing by far? A ride up the side of a mountain on a cable car, peering below, voyeuristically, on the impoverished neighborhoods, infamous around the world, where the cocaine was piled high, and also the hills of dead bodies. Some were deposited from the drug wars, some from the paramilitary, some from the guerillas, many victims of the US-backed government. 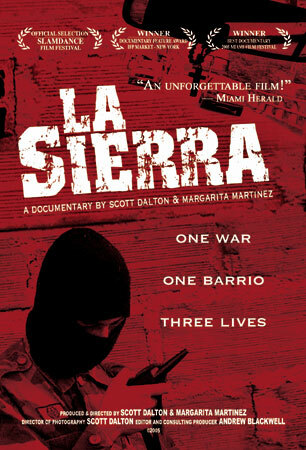 You crawl down from the cable car to the actual slum streets for Scott Dalton's and Margarita Martinez's frightening, courageous documentary, La Sierra, December 8 at the MFA. Shot in a Medellin mountainside neighborhood run by the paramilitary, La Sierra focusses on the most mesmerizing personage in any recent movie: Edison, 22, the homicidal local commandant, who, when not shooting off his rifle at leftist rebels (often on camera), tools about on his motorcycle impregnating teenagers, they thankful to be mothering his babies. He's a mini-Mack the Knife, operatically eluding the police...until (we're there in La Sierra) that fateful night of the dance. Should La Sierra keep Americans from visiting Medellin? "That was 2003," my hosts told me of the movie, which has played on Colombian TV. "This is 2005."